Fifteen years ago, my now-husband and I went out for our first Valentine’s Day date. We went to a nearly-empty pub, sat down for a beer, and within 10 minutes some drunk guy we’d never met had twisted his barstool around started describing the sordid details of his ongoing, bitter divorce. We were young, and West-coast raised conflict avoiders, so we allowed this guy to steam-roller our date with an hour of angry relationship advice. That evening was brought to us by cheap lager and betrayal. We stay in for Valentine’s Day now. 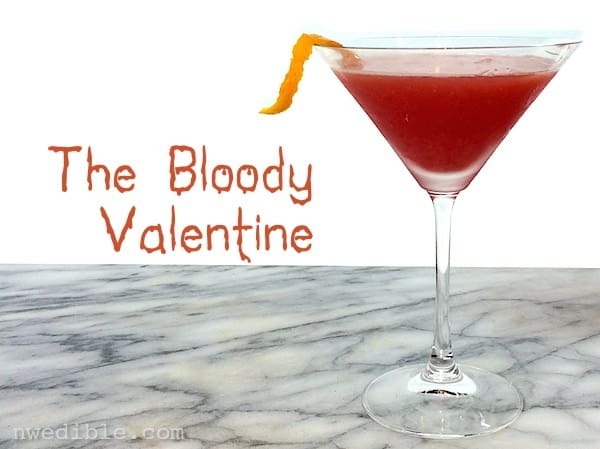 If, like me, you aren’t really a sappy-card and dozen-red-roses kind of girl, freshly squeezed blood orange juice, blood orange liqueur and bourbon makes a charmingly macabre drink for Valentine’s Day. The color comes out reddish-pink, but the flavor is all exotic citrus and smokey whiskey. Makes 1 rather giant cocktail, or 2 petite pours. Shake all ingredients hard with cracked ice. Strain into a chilled cocktail glass. 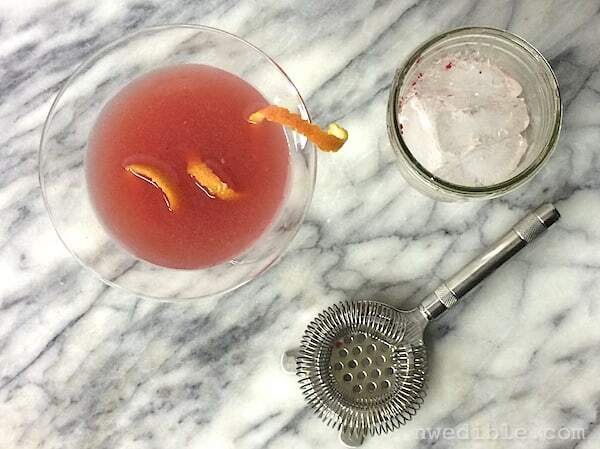 Garnish with a twist of blood orange peel. Happy weekend, and happy Valentine’s Day, friends. I’ve gotta say, I’m not a card and flowers kinda girl either and we tend to stay in for VDay as well. But I do love the idea of The Bloody Valentine. Very clever and sounds delish! thanks! We just moved to MA and are preparing for Valentines and more shoveling. Courageous move, Castle! My daughter wants us to relocate to MA. (Yikes – snow is taller than our grandchildren!) I’m a spoiled west coaster by now, so am spinning at the options. How did you decide? I have never been a Valentine’s Day girl myself. My husband and I do exchange cards on the day but the day after we usually go out for breakfast. To my mind I want someone who will be there the day after V day. So after 40 years of mostly happy marriage I am looking forward to my day after breakfast. Somehow it feels like we are still going steady…still best manners. 🙂 I’m a lucky girl. Hmmm…I think I may try a variation on this today. 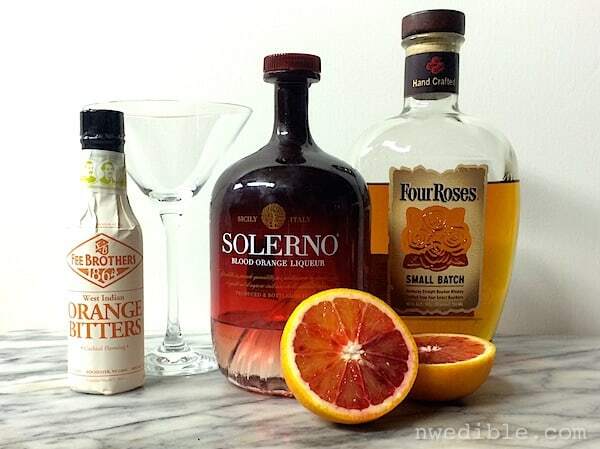 How about bourbon, blood orange juice and some Aperol? Couldn’t find my orange bitters (which I DO own) and tend not to buy one-off liqueurs, so I went with blood orange juice, bourbon, a splash of sweet vermouth, and a splash of triple sec. Pretty good as is but would love to find my bitters! We always do Valentines Day a few days early to avoid the Love Tourists at the better restaurants. Actual V-Day takes place at a random not-super-romantic bar with nibbles.